This beautiful OAK Wood Nightstand with one drawer is perfect for anyone looking for solid wood bedroom furniture that will last a lifetime! They’re great as children’s bedroom furniture, but adults will also love the look and feel of real solid wood furniture. The three roomy drawers are perfect for bedroom storage, and the solidly built stand in a simple, classic design will go perfectly with your other bedroom furniture, no matter what your design style! 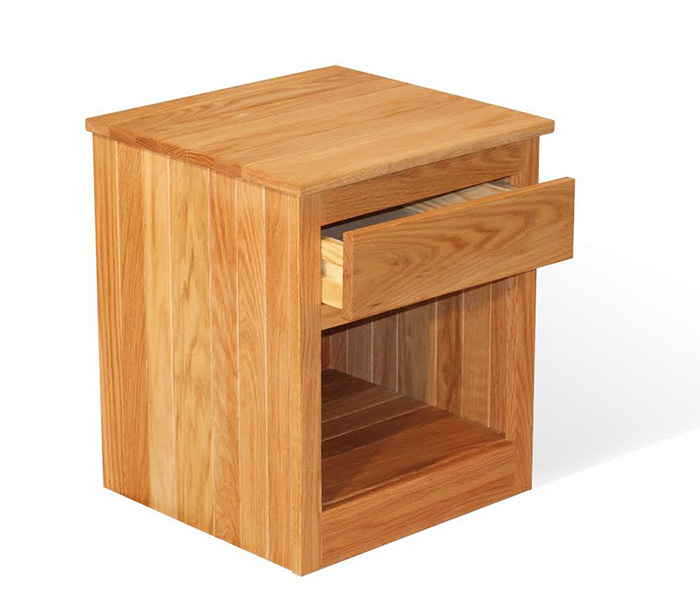 Our OAK bedroom nightstands are made with tongue & groove sides & solid drawer fronts. Our Oak Bedroom Nightstands are unfinished, chemical-free, and made in the U.S.A. They ship direct from our factory in central Pennsylvania, where we craft sustainably harvested Pennsylvania Red Oak and Southern Yellow Pine into some of the world’s most affordable eco-friendly furniture. The glue we use is non-toxic once dry, which is how it arrives. The backs are made of Luan and may not be suitable for customers with severe chemical sensitivities. * Solid OAK Wood Nightstand – Cheap! Our 1-drawer Oak bedroom nightstands are the perfect complement to our OAK solid wood platform beds (sold with our without headboard). Our hand-rubbed Linseed Oil finish serves as a conditioner for the wood, helping to preserve its beauty for a lifetime. The hand-rubbed linseed oil completely gives our Oak bedroom nightstand a deep, rich color, as this image shows. Because the oil fills the pores of the wood, finger prints and day to day dirt are less likely to be absorbed into the wood in comparison to unfinished wood. NOTE: Linseed Oil is NOT the same as a Lacquered/Glossy Finish; instead it is oil that leaves a slightly silky feel to natural untreated wood. NOTE: Oak Nightstands are Unfinished, but are offered with an Option to be Oiled for an additional fee. The image used here is displaying the OILED VERSION; Unfinished will be slightly more pinkish and slightly more pale (less saturated looking), and able to be stained or oiled yourself very easily. Available Unfinished or with a Hand-rubbed Linseed Oil. We also offer a warmer, darker Medium-Oak stain option for $30 more. Custom staining is an option too! A Ton! Literally on top probably, but please don't try this at home. Solid oak sides, face frame and top provide for exceptional strength!